Closed – See you next year! Gate Hanging is Friday, March 22, with practice AFTER all gates are strung. Downriver Race will start with a Racer’s meeting at Fishermans Put-in at 4:30 pm, and racing begins at 5 pm. On Saturday, the MANDATORY Racer’s meeting is at 8:30. Racing begins at 9:30. On Sunday the races are scheduled to start at 8:30, following the MANDATORY Racer’s meeting at 8:30. Under 18 ($25). Late Registration Fee ($15). The ACA event fee is $5 for non-ACA members. You WILL be charged $5 if your ACA number is not provided for insurance. Saturday 6pm (dinner starts at 7) March 23. Arcadia Academy, 211 South College Street, Arcadia, Missouri 63621. The races wouldn’t be possible without our many volunteers. Interested in helping this year? Watch the video below to experience the MWC from set up weekend to race day. If you cannot find the information you need, contact the Race Director at [email protected]. For info on volunteering, contact the Volunteer Coordinator at [email protected]. Bibs will not be given out until the registrar has your signed ACA waiver. A backup weekend is currently not planned. Refunds: Refunds will only be issued only if the race is cancelled or water levels exceed personal limits/ability. $20 will be deducted to cover service fee & t-shirt. A race t-shirt will accompany all refunds. Races will follow traditional MWC race rules (based on ICF rules, but with some exceptions, primarily in classes, age groups and scoring. Scoring will use 0/5/50 and best of two runs). Number of runs & classes: Individual paddlers and tandem teams are permitted a maximum of two judged runs per slalom class and a maximum of three slalom classes (4 total runs) per day. Race Committee reserves the right to limit total number of runs and classes. Awards are presented to the first three eligible finishers in each class. There must be at least three boats to constitute a class. Awards are presented after course takedown on Sunday. Note that under the ICF minimum length rule (11′ 5-1/2″), a number of old-school plastic K1s would be legal to race in Olympic. “Expert” classes allow any length boat, but plastic-only. “Novice” means the paddler has never placed (medaled) in a Slalom race before, regardless of skill level or years boating. Also, if the paddler has medaled in the Downriver but not Slalom, he/she may run “Novice” classes for slalom. Age group classes are for plastic boats only, any length. C1 Plastic is any length boat, with no age classes. Plastic K1 classes are broken up into Long (7′ 6″ and up) and Short (under 7′ 6″) boats. There is no segregation by age or skill in the Long/Short classes. Paddlers may run one or the other, but not both. Downriver classes have changed, by popular demand. Kayak classes will be by length, Under 10′, and 10′ & over. Kayak Novice is any length. No age groups in Downriver this year. Paddle fast!! The downriver racers’ mandatory meeting is at Fisherman’s Put-in Friday at 4:30 PM. The race will be an interval start. Be ready to go in bib order or you risk missing your run! Rudders are prohibited in this race. For the downriver race, “Novice” means the paddler has never placed in a Downriver race before. Paddlers who have medaled in Slalom but not Downriver may run the “Novice” class. Note that someone who meets the definition of Downriver “Novice” may enter K1 under 10′ or K1 10′ and over instead, if he/she chooses. Boatercross is open to all ages (with signed parental consent for minors), boats (canoes, kayaks) and gender. There will be strict disqualification for ANY intentional harm to another paddler or “skirting” the gates. No slashing with paddles, punching, grabbing or pulling on another PERSON, their helmet or PFD. Boat loops may NOT be taped down. Competitors should keep their hands on their paddles as much as possible. Paddlers can reach across the deck of a competitor in order to plant a stroke in the water. No pulling on grab loops, skirt loops, cockpit rims, etc. Competitors will be assigned to heats of 3-5 boats. The Boatercross director will explain the course (negotiation of gates, buoys, obstacles, etc.) before the start of the first heat. When announced by the Starting Judge, each heat of racers will line up side-by-side, bows facing downstream. The start will be a “rolling start” so that when the Starting Judge determines that all racers in a heat are lined up EVENLY, he/she will immediately announce “GO!” as the start of the race. When lining up competitors, the Starting Judge may ask racers to “Back-up,” “Move Forward” to ensure that the boats are lined up and no one has an unfair advantage. Racers should pay close attention to the Starting Judge, as he/she may announce “GO!” at any moment after deciding that the boats are lined up evenly. Any racers who fail to respond to the commands of the Starting Judge’s orders may be disqualified from the event. When the Starting Judge says “GO!” racers will paddle into the main flow of the river, negotiate the course, and cross the main finish line at the end. Each heat will be completed before the next one begins. When the top two finishers of a given heat are identified by the Finishing Judge, they will be required to follow the instructions regarding who they will be paired up with for the next round. There are no separate gender or boat classes in Boatercross unless enough racers (4) sign up to create a separate class. Competitors may race in kayaks (K-1), or canoes (C-1), solo or tandem. Note: since this is a head-to-head style race, timing the racers is NOT required. 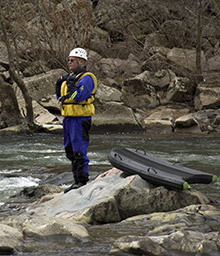 Paddlers: PFDs and protective whitewater headgear are required. Wet suits or dry suits are STRONGLY RECOMMENDED. Be prepared for cold water. Boats: Decked boats must have endloops and be unsinkable. Full flotation and/or bulkheads will suffice. Open canoes must have endloops and no less than 10- and no more than 15-cubic feet of secured flotation which must be below the water line & not impede water flow. Boat inspection: All race boats must be inspected and pass length, material and safety (flotation) requirements. NOTICE: Boats not meeting flotation requirements will not be allowed on the course! Race Safety Support: Each racer completing the course must remain afloat at the finish to help with safety until relieved by the next 2 boats. Volunteers: If in doubt, see the Volunteer Coordinator on Saturday morning for volunteer needs. Thanks! Work Assignments: Paddler work assignments are required each day the paddler races. Racer is responsible for getting & fulfilling work assignments. Worker substitution is allowed (family member, etc.)! Not working may result in disqualification! Safety Boaters: Must be proficient in on-water rescue. Selection determined by Safety Chair. Racers are required to assist other boaters as needed. Each boat completing the course must remain afloat at the finish until relieved by the next 2 boats! Sales Table: Selling shirts, raffle tickets, banquet tickets. Must be MWA member in good standing & over 18 years old. Public Address: Announce races, and other events over PA system. The following require pre-event training. We’re happy to train! Start Line: Organize racers in correct order, relay start times to scoring tent. Communications: Send times, gate scores, other data between start/finish, judging stations and scoring tents with via radio. Timing: Operate one of the following: start or finish timing, boat scheduling at start. Scoring: Operate computer scoring, organize times, gate scores or post scores. Judging: Observe racers passing through gates & mark penalties, communicate scores via radio. We will mail them out to you (with return instructions) FOR FREE. This event is organized solely by a large volunteer staff of about one hundred people. We would like to offer companies a chance to shine by donating a gear item or gift certificate that we can use to reward our volunteers after the event is over. If you or someone you know may be interested, please download our donations request letter. Setup: Initial wire setup will be on Saturday, March 16, beginning at 10 AM. This involves stringing wires for the gates across the river, so bring your gloves, wire cutters, pliers, and water. No experience necessary–we will teach on-the-fly! A Slalom Clinic is planned after the wires are strung (free to volunteers, $20 to others). Free camping and party follows on Saturday night for setup volunteers at the Silver Mines Group Campsite (see map). Final course setup (stringing the gates) is the following Friday, March 22, followed by gate practice, race training or recreational paddling. Come help out and have fun! Friday night, after the Downriver race, we will have live music at the takeout. The music will be at the D-bridge Pavilion, near the Riverside campground. Food will be available for purchase. Come & celebrate our annual race at this unique event. Downriver awards will be presented at the Pavilion. Saturday evening beginning at 6 PM (dinner at 7), at the Arcadia Academy, 211 South College Street, Arcadia, Missouri 63621. You will be able to reserve your ticket in online registration or by sending in money with your registration form. Tickets are $15 and will also be available at the t-shirt sales table until 3 PM the same day and also at the door that evening (if any tickets remain). Paddler/Volunteers’ Raffle: A drawing will be held Sunday after course takedown for racers and volunteers (remember: helping to take down the course is MANDATORY for all racers). Paddling gear and accessories may be among the surprises given away! Millstream Gardens & Silver Mines Recreation Area are located west of Fredericktown, & east of Ironton/Arcadia off State Highway 72 (see map). Fredericktown is about 90 miles southwest of St. Louis off State Highway 67. Lodging, food, gasoline, etc., are all available in the Fredericktown/Ironton/Arcadia area. Camping is available at Silver Mines Recreation Area (see map). Concessions will be available at the race site both Saturday and Sunday. Parking: Due to limited parking at the put-in, only racers and volunteers will be allowed access. All others need to park at the visitor parking lot. Failure to comply may result in being ticketed by Missouri Dept. of Conservation officers. An overflow parking lot may be available. Warning: parking may be muddy. Other Rules: Please don’t litter. Spectators and racers should pick up after themselves and others-use waste bins. Dogs must be leashed at all times! No outside solicitation is allowed. Alcohol will not be sold but you may bring your own—please drink responsibly. 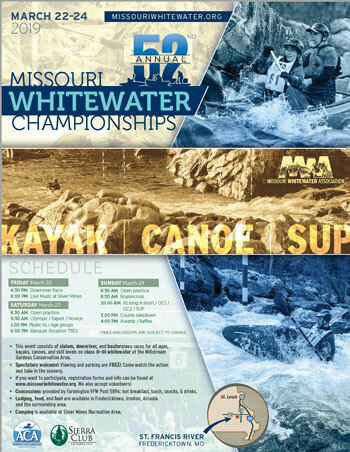 The Missouri Whitewater Championships are organized and administered by the Missouri Whitewater Association, with lots of invaluable help from the Sierra Club Eastern Missouri Group, the Missouri Department of Conservation and lots of other volunteers and organizations. These races are sanctioned by the American Canoe Association (ACA).